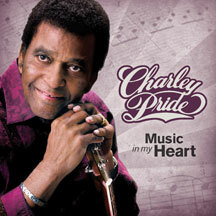 Country Music legend Charley Pride returns with a new studio album produced by acclaimed Country artist Billy Yates. Charley Pride possesses one of the quintessential Country Music voices and remains loved and respected around the world as Country Music's first black superstar. Pride is currently celebrating over 50 years as a recording artist. His fans have been waiting for over 6 years for Pride to record and release new recordings, as his previous studio album was released back in 2011. Over the last year, Pride has been hard at work crafting many new recordings with artist-songwriter Billy Yates taking on the producer's role. Yates, a highly-acclaimed, traditional Country artist and songwriter, is best known for penning the Grammy award winning song "Choices" and "I Don't Need Your Rockin' Chair" for the legendary George Jones. But he's also had a number of Country hits himself and has written songs for many fellow Country artists including George Strait, Kenny Chesney, Chris Young, Rhonda Vincent and Sara Evans. This Pride/Yates collaboration has resulted in Music In My Heart, a stone-cold, traditional Country album that marks a high-level return to form for Pride. The 13 new recordings include songs penned by such acclaimed songsmiths as Ben Peters, Merle Haggard, Bill Anderson, Tommy Collins, "Country" Johnny Mathis and Yates. Initial awareness efforts will begin this Spring starting with Pride's Facebook page which now boasts over 750,000+ followers. The release will be supported by ongoing social media and online promotional campaigns targeted at Classic Country fans, and promotions at mainstream Country and Classic Country radio outlets. Pride will also feature new music from this album at upcoming tour dates. Pride, a three-time Grammy winner, will be further honored by the Recording Academy this summer with a Lifetime Achievement award. With this album being released in close proximity to the date of the awards ceremony, there will be a high-level of increased awareness about Pride and his legacy upon release.